maui. — basic & boujee. maui has so much more to offer than the comforts of your hotel. so if you are ready to leave your spot on the beach, here is a sampling of the aloha spirit. maui dive shop is your one stop shop for booking all activities, but here are some favorites. hike maui take you through the backcountry where you will hike to 4-5 waterfalls that you can swim in. ask for sarah to be your guide and a small lunch is included. it isn’t hawaii without a dinner cruise on the alii nui or a luau at the grand luau at hanua’ula in wailea. if you are feeling adventurous go zip lining at the piiholo ranch. there are so many resorts and vacation rentals on the island… we will leave this one to you. the mill house at maui plantation has beautiful views and a trendy menu located in central maui. leoda’s kitchen and pie shop is a quaint lunch and pie spot on the side of the highway on your way to lahaina between mile marker 14 and 15.
merrimans in kapalua has spectacular views and great food. we recommend an early dinner here to fully enjoy the landscape and sunset. mama’s fish house is what you expect when dining in hawaii with island decor and great views. maui brewing is located in a business park but don’t let that stop you for enjoying the fresh beer in a relaxed environment. 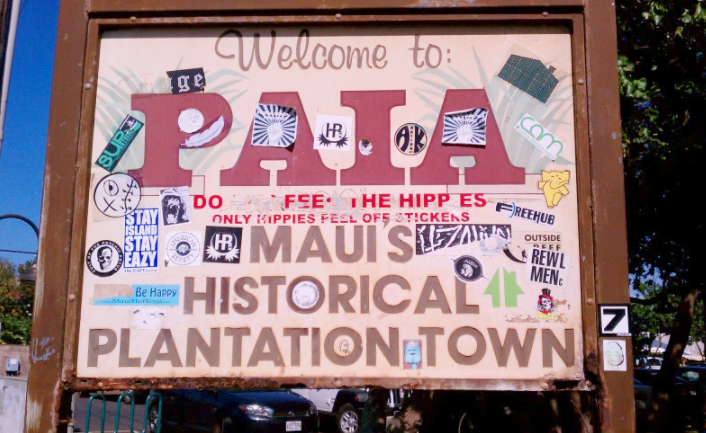 the town of paia is a cute little hippy town as you head toward the northeast side of maui. be sure to stop at baldwin beach to watch the kite surfers. the winds are strong on this side of the island which creates a strong current perfect for the skilled surfers. the town is full of small businesses and great to walk through. the paia fish market or paia flatbeard company make for a tasty lunch. another beach to explore is big beach (near wailea). the shorebreak is ridiculous so better for sunbathing on this crazy huge beautiful beach. this guide was perfectly laid out by ashley's sister, heather, who spends 3-4 weeks in maui every year. she is making it her goal to do everything on the island. drinks at the grand wailea.